Susie Bright screamed naked. The Santa Cruz-based author belonged to a Facebook group called "I will walk out my front door naked as soon as Obama wins!" America went a little crazy on Tuesday night, finding a diversity of wild and wonderful ways to celebrate or to protest Obama's historic victory. That "naked" Facebook group had 227 celebrating members — and on election day, their reports began rolling in. "Its dark and cold here in Vermont, but it felt great!" "I did it too! In fact, I danced on the front porch, and yelled 'Whoo hoo!'" "My partner and I went downstairs in our robes, dropped the robes and cracked up like a couple of giddy schoolgirls!" And in Santa Cruz, Susie Bright reported that she "tore off my clothes and ran out on the front porch and screamed my head off." Facebook users have already started another dissenting group called "Impeach Barack Obama." In fact, they've started 30 different groups with variations on the same title, with a total of over 9,000 members. But soon other users were joining a competing group — called "Deport Those Who Wish To Impeach Barack Obama." And another user's group was titled simply "MCCAIN LOST! GET OVER IT!" Another Facebook user tried creating a group called: "I bet I can find 1,000,000 people who hate political Facebook groups." It currently has just 19 members. Meanwhile, political cartoonists around the world responded to Obama's victory with images that were nearly identical. Twelve different cartoonists drew Obama with the Lincoln Memorial, while nine more drew him with Martin Luther King. But the response wasn't confined to the U.S. 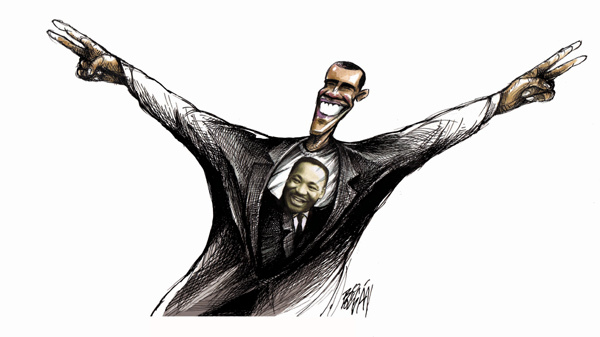 In Mexico City, Angel Boligan drew Obama wearing a Martin Luther King t-shirt. 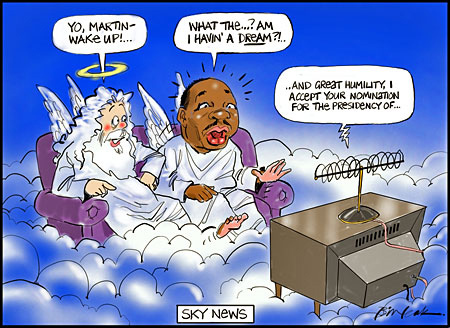 In Australia, Bill Leak drew King in heaven asking "Am I having a dream?" 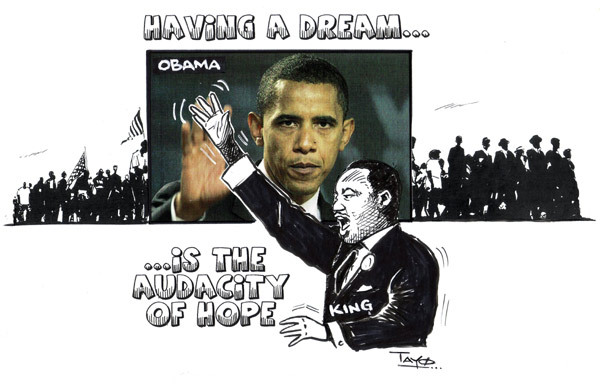 And in West Africa, Tayo Fatunla drew King in front of a picture of Obama, adding the caption "Having a dream...is the audacity of hope." Wednesday South Park aired a story lampooning Obama's victory just one day after the election. The production staff "will be up all night working on Wednesday’s show," their blog announced Tuesday, and Trey Parker told the L.A. Times they'd decided that "we're just going to make the Obama version, and if McCain somehow wins, we're basically just totally screwed." They were still dubbing in dialogue hours before the episode aired — including actual text from Obama's victory speech. But Parker told the paper he was sure Obama would win — because of the odds at a sports betting site where he gambles on football. A celebrating college radio station in Oregon played nothing but musical mixes of Obama's speeches for over an hour. "It's really great to see people happy again," the DJ explained. "That's what the whole Obama thing is about." A Utah newspaper reported that "Local gun dealers quickly are running out of stock of magazines for Colt AR-15s and AK models." They're not stocking up for militias, but anticipating Obama's reinstatement of a federal Assault Weapons Ban. "Pretty much anything with more than 10 rounds is in high demand right now," a gun salesman told the newspaper, noting that one dealer had sold 82 assault rifles in a single day. Wednesday someone registered the domain Has Obama Taken Away Your Guns Yet . com. In enormous letters, the site displays a single word. And in a smaller subtitle, it quotes a famously-misspelled protest sign. On Tuesday, a realtor in Georgia had also registered the domain I Blame Obama.com. All the attention landed him a book deal, and he's launched a charity site — where he's promoting his book and selling "freedom memberships" to the site — though he adds that "I will honor and support my president, but there will be no free ride." He's not the only one selling clothing to "commemorate" Obama's victory. An ad on CNN argues that history was just made. "And it comes in your size." "Dear Sarah Palin," read a sign in a picture framing store in San Francisco. "We eagerly await your $150,000 clothing donation on Nov. 5th. Andrew Sullivan supported Barack's candidacy, and celebrated Thursday by noting a sweet vindication from the state Pennsylvania. The county that Sarah Palin had called "the real America"? Blogger Steve Benen observed the historic moment with another startling discovery. 2009 will be the first year in 45 years without a Dole or a Bush in elected office. 45 minutes after Obama was elected, Roger Ebert wrote that "Our long national nightmare is ending." The 66-year-old film critic was quoting a speech Gerald Ford gave after assuming the Presidency from Richard Nixon. "I agree with Oliver Stone," Ebert wrote, "that Bush never knew he had been misled [into the Iraq war] until it was too late. "I blame those who used him as their puppet." 16. Predicted in the 60s? But shortly before his death last year, 84-year-old Mailer had made one of the only political campaign contributions of his life — to Barack Obama. The violent clashes at the '68 convention haunted Democrats — but one liberal who never understood the protesters was Barack Obama's own mother. "Emotionally her liberalism would always remain of a decidedly pre-1967 vintage," Obama wrote in The Audacity of Hope, remembering that his mother's heart was "filled with images of the space program, the Peace Corps and Freedom Rides, Mahalia Jackson, and Joan Baez." Obama gave his victory speech at the same park as those violent police-protester confrontations in 1968 — and pundits couldn't miss the symbolism. Obama "stands on the shoulders of the crowds of four decades ago," according to one protester. Now a sociology professor, Todd Gitlin told the New York Times that Obama's rebellion "takes the form of practicality. He has the audacity of reason." But one injury was reported Tuesday night — Chicago Sun-Times journalist Lynn Sweet, who injured her shoulder rushing to cover Obama's speech. In his first press conference, Obama noted wryly that "I think that was the only major incident during the entire Grant Park celebration." 19. What took you so long? 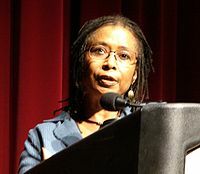 The morning after Obama was elected, he was told he'd been expected by Alice Walker, author of The Color Purple. In an open letter, the 64-year-old author wrote that Obama had no idea how profound it was for southern blacks, though America's first black president was already "with us" and "in us" in previous generations, and "Knowing this, that you would actually appear, someday, was part of our strength." She closed her letter by saying Obama's smile "can find an answering smile in all of us, lighting our way, and brightening the world. In 2004, Martin Luther King's widow had witnessed Obama's first address at the Democratic convention. King's daughter remembered that night after Tuesday's election results, saying her 76-year-old mother had said "Bernice, come here. "I think we got somebody." Not to ruin the party but it looks like Mossad already owns Obama (he picked Rahm Emanuel, the son of a terrorist as Chief of Staff). Obama will probably let Mossad slide on their 9/11 involvement and Obama will continue their wars. So who won? Israel did, as always. 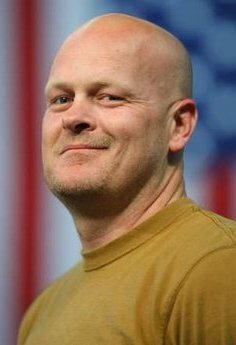 Like Nancy, the ripublicans have already polished they’re christyall balls. FYI: The county you refer to is in North Carolina. Is Obama so inept that even he thinks there are no blacks or other minorities good enough to serve on his staff? Why is there no blacks on his staff ? Why is his cabinet 99% Jewish ? Jews who make up ten percent of the population make up 99% of Obamas cabinet. What is the problem here? There is something fishy going on here and it is evident that Obama is Israels boy and not Americas. It is evident the Jews of America own Obama. It is also evident that the Israli Mossad own Obama and because of this he is a traitor already to America. Obama is Jew owned and Jew sponsered and you will see nothing but Obama licking the boots of Israel and every Jew he comes across. the fact that he has a toal Jewish cabinet is in place to keep Obama in line for the Jews and Israel. Mark my words! Obama will put the interest of Israel first, second and third wereas he should be putting America fist. Obama is owned and he is not the first black president , just another zionist puppet goyim owned for Israels purpose. Obama will do nohting for America or civil rights and security of America. He is there for Israel only and for the purpose of letting Israel get away with the genocide and crimes they have always been getting away with concerning all of their installed presidents. Lastly. when the economy fails ( beyond Obamas control) and it will pssibly this spring or mid summer and rioting and civil unrest starts, Obama is the man to speak to the blacks in order to subdue them. That is why he was elected! His only purpose is to keep blacks from rioting when the government screws each and every one of us while they bal out their Zionist Jewish bankers with your money. This is the final act of looting by a corrupt government , leaving the ball in the hands of an inexperianced man such as Obama , but hoping because he is black he will be able to keep the masses from civil unrest. Ain’t going to happen. Obama is nothing more than another zionist installment to protect the Zionist criminals we already have in government. And yes , Rahm Emanuel is the son of a terrorist and he knows it, Obama has always surrounded hinself with shdy charactors and he is non the better. Look for an even more screwed up government taking your civil rights away for the beenifit of Israel so you will be under total eternal control of Israel and the Zionist. Time to wake up and take back Americ because Obama is not your man. Yes Israel wins this election again. God are American people stupid! I hate people with the wrong color skin and Obama is one of those. I am not racist, I am a Christian.